As said earlier, limited internal fuel storage was a problem with the entire Stuart series of tanks. Sometime prior to the introduction of the M3A1, experiments were conducted regarding the mounting of two rubber coated, self-sealing, 25 gallon auxiliary fuel tanks on the vehicle’s upper deck. These auxiliary tanks fed their fuel, by gravity, directly into the Stuart’s two main fuel tanks. With this additional fuel the range of the Stuart was increased to 135 miles on good roads. The idea being that the fuel in these external tanks would be used first, in order to get the vehicle to the battlefield. Then, when empty or when combat conditions required, the fuel containers could be jettisoned from inside the vehicle. Each auxiliary fuel tank had two locking pins, which were wired, to release handles inside the vehicle. An auto closing fuel connection was also provided. This remote control mechanism allowed the crew to jettison either or both fuel tanks at any time without exposing themselves to enemy fire. Often the empty auxiliary fuel containers were picked up off the battlefield by supply crews and reused where possible. While overall there are very few combat photos showing the Stuart carrying these extra fuel tanks, it would seem that nearly every late production Stuart built included accommodation for their use. 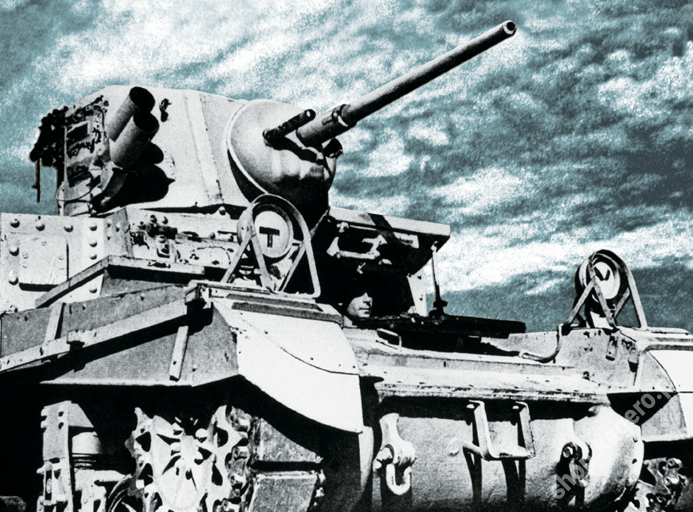 The earlier M3 Light Tank, like many of its predecessors was constructed of heavy (for the day) flat armor plates joined at the corners by rivets. However, this form of construction was soon found to be a serious safety hazard to the crew within. The problem was to prove a painful lesson that armor designers on both sides of the conflict were soon to learn. When the striking of an enemy shell deformed these armor plates, the popping rivets would fly around the interior of the vehicle with such force as to have a devastating affect upon the crew. It was possible for the armor plate of these early, riveted vehicles to totally deflect the incoming shell burst while the popping rivet heads flying around the interior would still cause the deaths of the entire crew. Two possible solutions were settled upon by military designers of the day: One being to join the armor plates by the relatively new continuous welding process rather than riveting. The other being to form the entire upper tank hull as one massive single piece of armored metal, constructed using the metal casting process. It is interesting to note that concurrent to these studies, the US Army was also addressing the same problem with their riveted M3 Medium tank known as the Lee (in the US) or as the Grant (by the British). For the Stuart the designers chose a partially welded hull, eliminating the rivets within the crew compartment. For the revision of the much larger Lee (M3A1 Medium) the cast hull was determined to be the answer. The reasoning behind these two different solutions becomes more clear when it is considered that the Stuart was being built by the “American Car & Foundry”, a company whose experience was in the building of primarily riveted and/or welded railroad car frames and bodies. The American Locomotive Company (Alco) on the other hand was the contractor for the Lee/Grant. Alco had tremendous experience in the production of large metal castings for the locomotive industry. Alco at about this same time was in the process of constructing for the Union Pacific Railroad the “Big Boy”. A massive locomotive of such weight and size as to become the largest steam locomotive ever constructed. Beyond the removal of the rivets and the welding of the armor plate surrounding the crew compartment, other improvements for crew safety were made to the M3A1 Light Tank. The earlier M3 Light was considered to have a rather high target profile when compared to similar enemy tanks of the same weight class and armament. Additionally the M3 Stuart lacked an emergency escape hatch for the Loader. To exit the older tank this crew member was required to either duck under the main gun and exit up through the commander’s copula or to crawl forward and exit through the driver’s or bow gunner’s hatches. 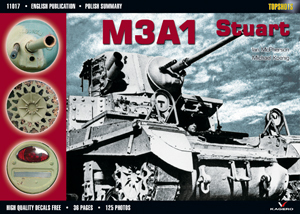 The redesigned turret of the M3A1 Light addressed all these problems. Known as the “horseshoe” turret, it was so named because of the shape the vertical side plate took upon coming out of the rolling press. Seen from above it is apparent that the turret sides form the clear shape of a horseshoe. For the A1 revision the commander’s raised copula was removed, thus lowering the overall vehicle silhouette by some nine inches. Twin matching left and right hatches were added to this redesigned flat roof allowing both Commander and Loader equal ability to exit in an emergency, not to mention the added comfort of equal light and ventilation. A fully rotating, 360-degree periscope for the commander was also added to the roof of this new turret. With the new design crew position and job assignments within the turret were changed to reduce the workload of the Tank Commander and improve his ability to watch for quick changes on the battlefield. In the old M3 design the Commander also doubled as the Gunner. This required him to leave his observation position, get down completely into the turret, sight through the main gun optics and fire the weapon. All these movements and operations took him away from the more important command functions of observation, battlefield assessment and target selection. With the new design of the A1 turret the Commander’s position was moved to the right hand side of the vehicle. He was now free to remain in his observation position while the main gun was targeted and fired on his command by the Gunner. This for the first time, allowed the Commander to literally be picking his next target before the Gunner had had time to place his first shot. Granted the Commander still did double duty in that he now had the secondary job of reloading the main gun. However given the modest size of the 37mm main rounds, the Commander could easily have several ready rounds “in hand” and the gun could easily be reloaded from above so the Commander was not required to drop back down into the turret for the firing of the main weapon.